1. Eat a fruit before you leave. A secret for avoiding all those unwanted calories while eating out is to eat a fruit just before you leave. High fiber fruits like apple, papaya, and guava will curb your hunger effectively and prevent you from choosing disastrous food options while ordering. 2. Replace your high calorie drinks with water. Ordering soft drinks or alcoholic drinks not only bring unnecessary calories but also an increased need to munch on sides. Let water be your favorite drink when you eat out. You can go for unsweetened fresh lime juice if needed. You can also go for green tea or unsweetened flavored tea if you wish. 3. Relish your food. Eat your food slowly and enjoy each and every bite you take. 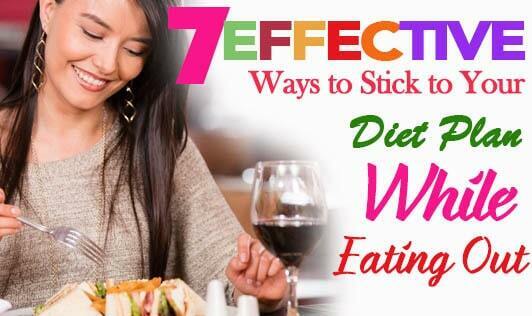 Chewing on a small bite of your favorite food prevents you from feeling deprived and keeps your diet very much on track. Enjoy conversing with your family or friends instead of focusing on the food, put down your spoon in between, and do not resume eating until you finish swallowing your previous bite. 4. Keep a check on your salad dressings. It is a very well known fact that salads are a good way of keeping your calories in check while eating out. However, if you are not careful with the kind of dressings you choose for your salad, no salad will work effectively for you. Choose vinegar dressing or plain salt and pepper seasoning for your salads. In case there are other choices, go for oil-based dressings instead of mayo or cream-based dressings. Also stay away from pasta-based salads to avoid adding extra calories. 5. Ignore the complimentary foods. Ignore the complimentary chips, colas; cheese, butter, and breakfast buns that you get along with your food, to avoid piling on extra calories. 6. Ignore the extras on your plate. If you want your diet to be successful, ignore the calorie-laden fried papad, cheesy dip, or mayo on your plate and choose roasted papad, salad, and salsa instead. 7. Say no to dessert. Try resisting the tempting dessert. Learn to say ‘No' whenever needed. You can order a fruit salad instead. It may be a difficult choice to make, but the satisfaction that it offers will be worth it. Sticking to your diet plan may be difficult while eating out, but it is definitely not impossible. All you need is a little self control.